At Bard College Berlin, the German Studies Program is fully immersed in the liberal arts life of the university. All students in our program acquire a comprehensive proficiency in German. Outside and beyond the classroom, the German capital makes for an authentic language learning environment. With its genuine multicultural atmosphere, Berlin is one of the most vibrant and inspiring places to learn German. 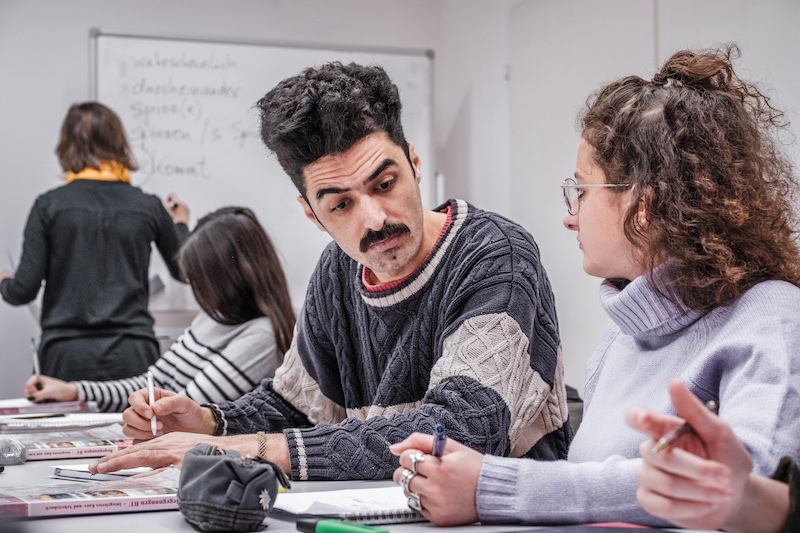 We are committed to making German a keystone of our students’ college experience: German language proficiency at any level helps to navigate the city with ease and confidence and to make new connections. It is a skill for gaining transcultural competence, for becoming a better writer and more articulate speaker, and for doing internships and accessing the German job market. Through partnership and cooperation, we promote exchange with other cultural institutions in Berlin, as well as with the German Studies Program at Bard College, New York. 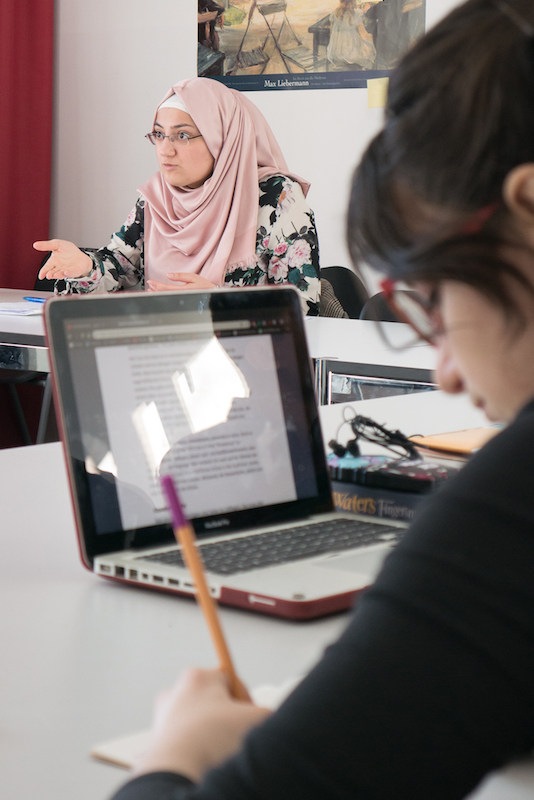 Various courses and activities in our German Studies Program are funded by the DAAD (Integra and STIBET). Students at Bard College Berlin are required to achieve German proficiency up to B1 level. All German language courses in our program are designed to foster skills in the core areas of language acquisition: speaking, writing, reading and listening. Language course levels correspond to the Common European Framework of Reference for Languages (CEFRL), starting at A1 and leading up to C2. 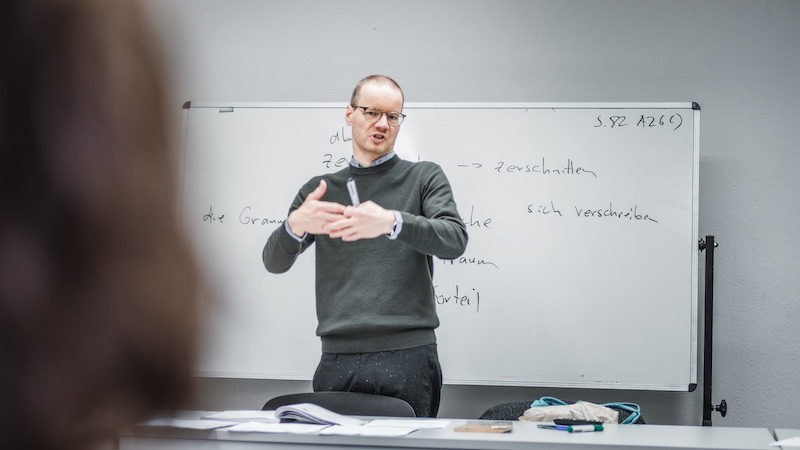 Beginners to advanced level courses encourage students to reflect upon linguistic structures and situate literature, films and music within Germany's rich intellectual tradition and complex political history. We teach in small groups of usually up to a dozen students, which allows for intensive communicative interaction. Our team has a combined background of teaching and research experience on several continents. All instructors teaching in the German Studies Program have earned degrees at high ranking universities. Areas of special expertise include language acquisition methodology, literary theory and history, and translation, as well as academic and creative writing. 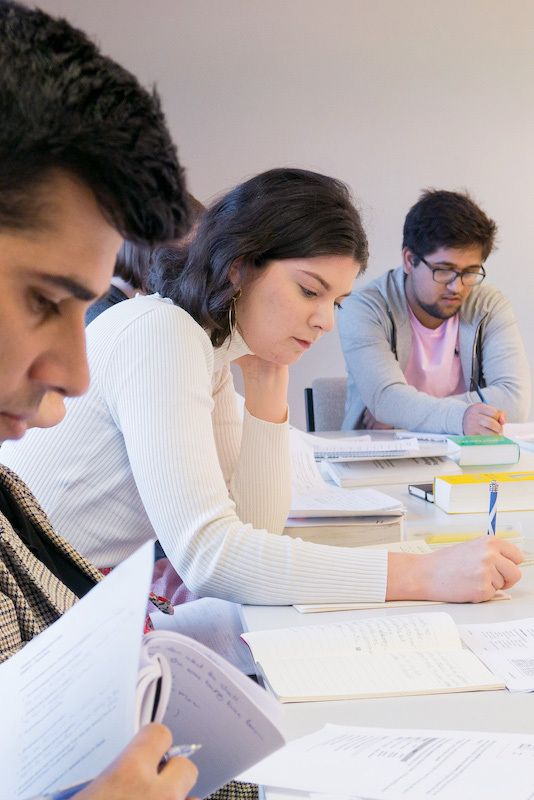 Our shared teaching philosophies promote a communicative approach emphasizing in-class interaction, while our ever-evolving curriculum fosters individual course design and the development of learning resources specific to our German Studies Program. An overview of useful links and online resources on German language, literature and media. A standard dictionary, used in our German Program for in-class writing exercises etc. The most widely acknowledged authority on German spelling. Also useful for differentiating between different meanings of the same word, usage as well as declension and tenses. A crowd-sourced online-only dictionary that allows to translate words back and forth between German and a huge variety of other languages. Online exercises and worksheets on German grammar and reading comprehension, as well as glossary. Also useful for lists of irregular verbs, verbs and adjectives with prepositions and playing “Galgenmännchen” (Hangman) online. Large collection of online and self-testing exercises on German grammar topics from A = Adjektive to Z = Zeiten. German language learning content for all levels provided by the Goethe Institut. Free, but registration is necessary. Free online exercises on more than 100 grammar subjects. The website also features a useful collection of access links to selected standard textbooks and vocabulary exercises for each level. A bilingual „daily soap“ podcast on German language and grammar and the challenges they can pose to both native and non-native speakers, explored and explained through conversations over coffee. Well-made and relatable. A – sadly no longer updated and thus partially dated – guide to some people’s idea of “cool German”. Some of it useful, some of it cringe-worthy. Unrestricted access to Germany’s cultural and scientific heritage: millions of books, archived items, images, sculptures, pieces of music and other sound documents, as well as films and scores, from all over Germany. Free online access to literary and journalistic works that have gone out of copyright and sometimes out of print. Includes canonical texts by all classic German writers, e.g. Johann Wolfgang von Goethe, Heinrich Heine, Franz Kafka and many more. Thoroughly researched articles and features on German politics, history and public affairs. The most widely distributed German weekly newspaper, covering international and national politics and culture. A daily German newspaper based in Berlin – the self-proclaimed “Hauptsstadtmedium”. A daily digest of newspaper and magazine articles on literature and culture (a German equivalent of LitHub). Audio- and Video-Podcasts of recently aired episodes of Germany’s best known TV daily news program “Tagesschau” and related programs on national and international news and politics such as “Tagesthemen”, “Nachtmagazin” and “Bericht aus Berlin”. Podcast versions of daily radio programs on current German literature, film, theatre, music, political debates etc., explored through features and interviews. Borders are meant to be constantly crossed, questioned, abandoned or pushed. Studying German is one way of doing this. Learn more about our students’ experiences – in their own words. When I came to Berlin four years ago I was immediately set on learning German to become part of the city through speaking the language. Not knowing a lot of German, I started off taking German classes at BCB, from which point I could notice my progress going really fast. My first German classes were focused on creating a solid foundation in grammar, writing and speaking, which was very necessary for my later advancements. 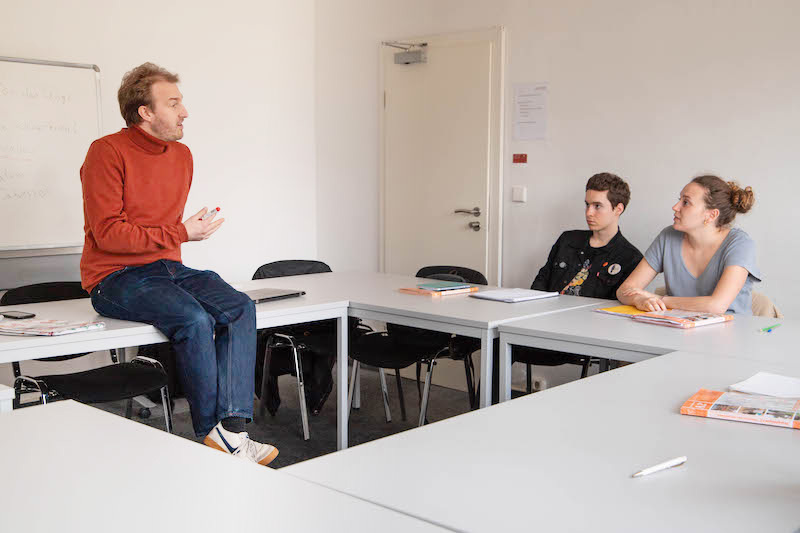 At the same time, these classes went beyond the merely linguistic aspect and involved learning about contemporary German culture, including music, books, films and even current political discussions. Furthermore, classes engaged with the city of Berlin through museum visits or other excursions, immersing the students in their living environment. Once I started taking an advanced German language course, the focus was not only on learning, but also applying our German skills. Through frequent essay writing and tests, we were asked to keep our progress up and also create our own opinions and “personalities” in German. More room was given for presentations about specific topics related to German(y), and a lot of the time was reserved for class discussions and speaking in general. This was the time I started to actually feel fluent in German. After taking language classes, I had the appropriate level to take German literature courses at BCB. These courses were centered around a certain theme, such as the Weimar republic, the relation between human and animal, and the German public sphere. 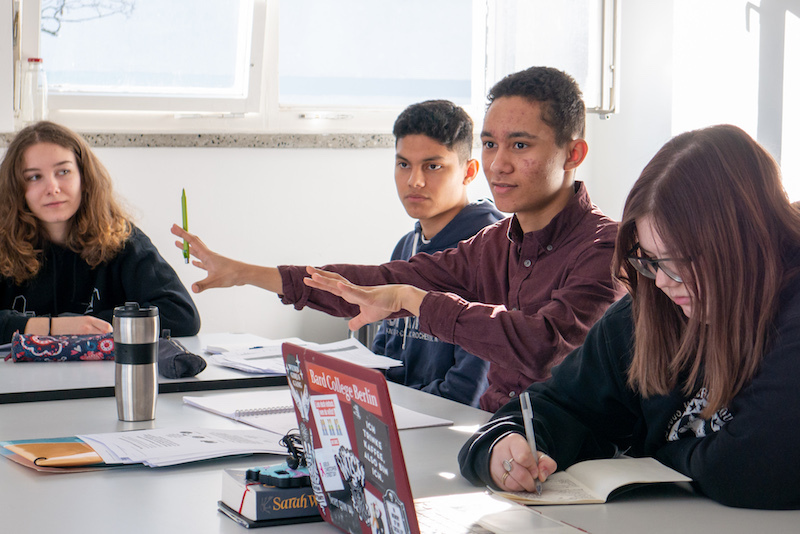 Through reading novels, academic texts and poetry, watching films, news videos and TV debates, these classes were focused on deepening our understanding of very specific topics that are best understood in the original German language. 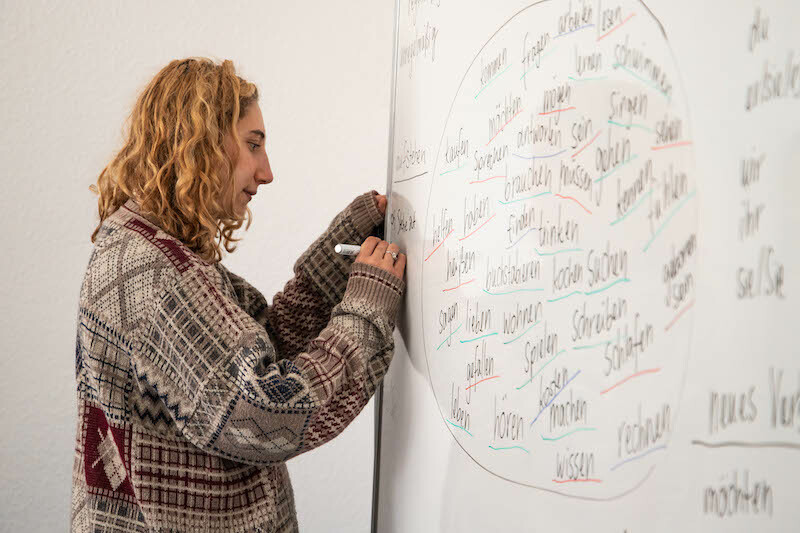 Students could learn from each other in these classes; the different proficiency levels of the students required careful attention to what everyone had to say, also because these classes were meant for students speaking German not as their native language. These classes prepared me better to have difficult discussions and to speak German in a more academic context. After taking German for around 3 years at BCB, I am currently working as the school's German tutor, helping students learn German with grammar, speaking and writing. All the grammar and general language skills I learned during my time at BCB, I now teach to the students who are studying the same as I once did. I think the strength of BCB's German language department is finding effective teaching strategies to make students understand rather complex grammar, through for example visual representations or other creative approaches. These strategies showed me at least that there is a logic to the German language! 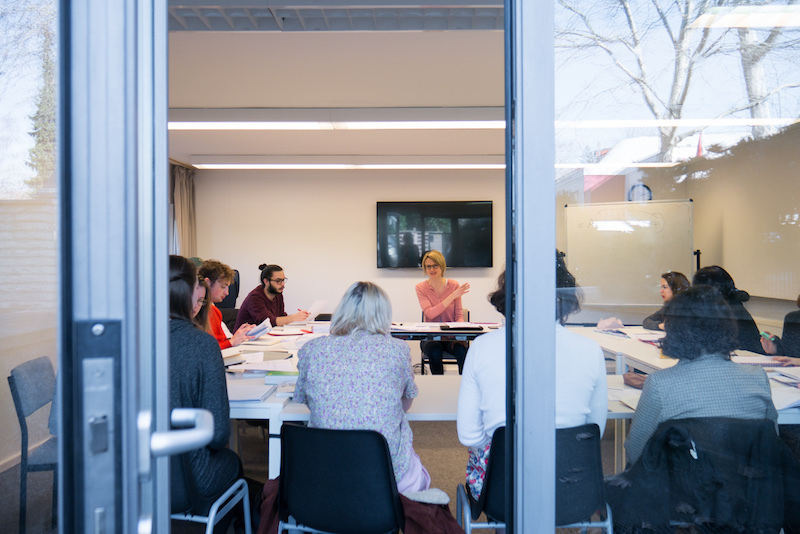 The German professors at Bard College Berlin place an emphasis on furthering your German in all respects – whether this is learning how to order a coffee in basic introductory German, or dissecting and being able to interpret a German theater piece. Although being half-German myself, I have never lived in Germany, so it was only until I enrolled in German classes at Bard College Berlin where my language abilities developed into something useful that I was able to truly engage with the language and the city of Berlin around me. My first year at BCB I decided to take a C1 German class which, through its more rigid structure, massively improved my grammar, as well as helping develop my spoken and written word. Once comfortable, I moved on to German literature and political classes which were more discussion-based and explored both historical as well as contemporary written texts to develop the knowledge and vocabulary of the students enrolled. The beauty of the German Program at BCB is that they offer a range of courses to build your German knowledge, as well as explore further interests in German if your language skills have already reached a point of comfort. 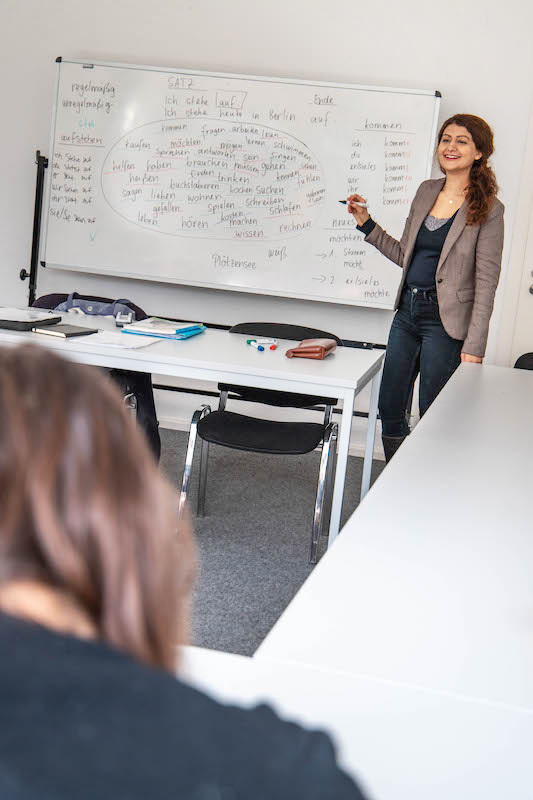 Being able to choose from more grammatical classes to literature classes provides choices for students with a range of German knowledge, as well as helps guide beginner students. I only have the warmest things to say about the German department and believe that anyone, whether you are A1 or C2, can learn from the German language classes at BCB. Learning German at Bard College Berlin was a wise decision I made. I had already learned German for some years in high school, therefore I wanted to carry on with what I started. Besides, my grandfather worked in Germany as a guest worker between 1970-75. For this reason, German language and culture have always been a matter of interest for me. I completed courses at Bard College Berlin from A2 to C1 level. Unlike my training in high school which ineffectively focused on pure grammar, the classes here, which incorporated many interdisciplinary elements, remarkably improved my German proficiency. Reading German literature, watching movies, presenting news, writing numerous essays in various fields are but few examples of such elements. Furthermore, small class sizes and friendly teachers made the classroom experience quite interactive, which allowed me to speak up frequently. I believe that the key to the culture, history and peculiarities of the people is the language, the place where it all is buried. When I first came to Berlin three years ago, I could barely speak German. Once I heard people talking, I was immediately obsessed with the way it sounded. Then I took a German class at BCB and started to observe how well-structured and powerful the language was. Learning languages is my passion, which made the process of learning German a very delightful experience rather than a tiresome one. I am majoring in literature, so reading German authors' original texts was my other motivation to learn fast. First, I started to read fairy tales and poems and found out how beautiful, poetic and incredibly smooth German language can be. Lately I fulfilled the C1 proficiency level which helped me to become more confident and to overcome the fear of talking with native speakers. However, I always find that there is something to improve. I read the German dictionary for pleasure and enjoy delving into the roots of the words. I am always fascinated by the fact of how German never stops amazing me. Learn about student activities, guest lectures, publications and more.